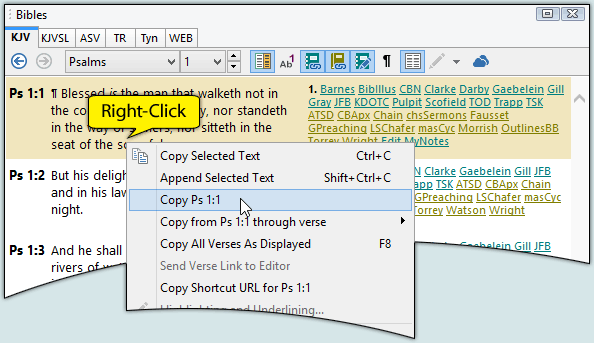 Here is a fast and easy way to copy Bible verses from SwordSearcher to the Windows clipboard that avoids having to "click and drag" text in the screen to mark it. Copying verses this way makes putting together sermons, Bible studies, emails, and other documents a breeze. Notice in the sample above that there is an option to "Copy Ps 1:1" and an option to "Copy from Ps 1:1 through verse >." 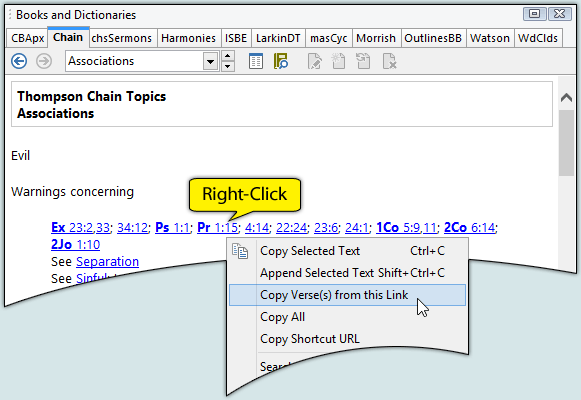 The first option copies the single verse to the clipboard, while the second option allows you to select another verse in the chapter to copy a range of verses. For example, Ps 1:1 though 1:3. Selecting "Copy Verse(s) from this link" copies the text of the linked verse to the clipboard. Another advantage to using this copy method (instead of marking text with the clipboard) is that SwordSearcher will format the verse according to your preferences, which you set in the Configure Verse Copy/Export Formatting dialog. Open this dialog on the Edit menu, and you can select from several different verse formatting options.